Today we read some great books about turtles. The children had a GREAT time counting down (out LOUD) from 10 to 1. This rhyme has lots of great rhythm and movement. The children enjoyed snapping their fingers and clapping their hands along with this one. 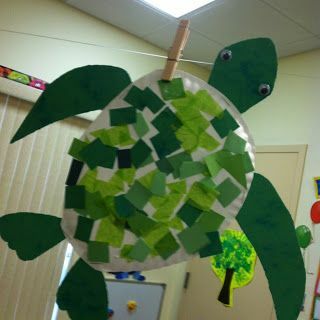 After stories, we made turtles out of paper plates, tissue paper, and construction paper. This was a simple craft that didn’t need a template. The children and parents just free-handed the turtle head, tail and flippers. For more great turtle titles, please click here. It looks like you had great fun with turtles a couple of months ago! Thanks for sharing my books. It was a pleasure! These were the best books for the age group that I read to, and they really enjoyed them.